House Majority Speaker Paul Ryan, known for being an athletic policy-wonk, was reportedly overheard at a Washington D.C. establishment speaking candidly about a recent dream. The source, who wishes to remain anonymous, heard Speaker Ryan describing the frightening event as a “vivid characterization of everything I find horrifying on this planet. It was a Demon Drink.” We dug deeper into this story and the details are surprising. The source detailed Speaker Ryan’s dream, which began with him at the start of a brisk 7:47/mile run on the National Mall. He soon became immobilized, however, overcome with feelings of sadness regarding the American Health Care Act’s failure. As he turned around, the Speaker saw the drink chasing after him. Sprinting up the Lincoln Memorial’s steps, Speaker Ryan supposedly hid from the “unicorn-inspired cup of sugar and hell,” which barreled toward the building with amazing speed. Perhaps if Speaker Ryan represented the average American he would have read the ingredients label. The Unicorn Frappuccino is created using all-natural ingredients: xanthan gum, potassium sorbate, carrageenan, natural flavor gum arabic, blue drizzle, sour blue powder, radish, sweet potato and sour blue powder. While the unnamed source overheard much of the conversation, it remains unclear if Speaker Ryan sought outside help following the event. 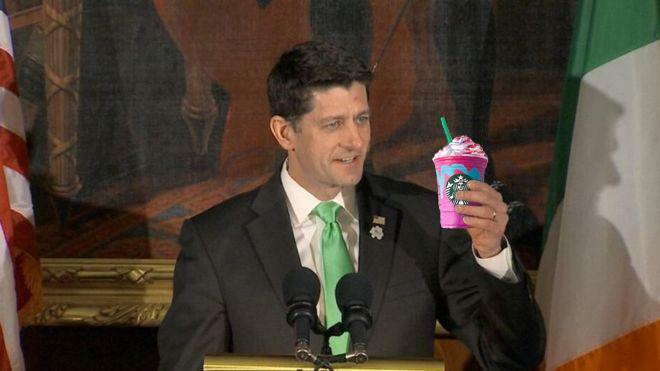 Speaking openly to Congress about the Frappuccino on Friday, Speaker Ryan denounced Starbuck’s latest creation. Understandably, with a potential shutdown of the government looming, the Speaker is under considerable pressure. Furthermore, with President Trump promising to reboot his health care repeal, we can only hope that Speaker Ryan moves on quickly.